When I moved here a little over two years ago, I made the mistake of assuming that if a State had adopted the IBC, it had also adopted (by default) the accessibility requirements in Chapter 11. Not so, as it turns out! Granted, the State of Minnesota, from where I moved, made amendments to Chapter 11… but I was somewhat shocked to learn that, until recently, the State of Louisiana was enforcing a version of the Americans with Disabilities Act Accessibility Guidelines that is 15 years old! “Well, what could be that different?” you might ask. As it turns out there are signiﬁcant differences: differences that will have an impact on design and execution as the State of Louisiana will begin enforcing the 2010 ADA Standards for Accessible Design as of October 1st, 2011. 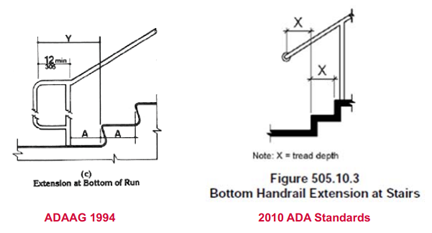 NOTE: The 2010 ADA Standards for Accessible Design are not necessarily the same as the requirements of IBC Chapter 11, which references ANSI A117.1, but attempts are being made to bring ADAAG and ANSI A117.1 a little closer in line. One change that I’m pleased to bring to your attention is the elimination of the stair handrail extension at the bottom of stairs. Hopefully you have learned this, and more at this year’s Chapter Seminar, which took place on November 10th, and you’re probably already marking up your copy of the 2010 ADA Standards!